Just two more days before we #CrashCityHall to demand safer streets, and ask LA city leaders to have the courage to do the right thing. Something that has been seriously lacking in the past year. You still have time to send in your letter if you can’t make the 10 am city council meeting. And come back this afternoon when we’ll post another open letter to the LA city council, this time from Sean Meredith. It’s not every day you can get a deal on great bike, and support a good cause at the same time. The CBS2/KCAL9 Cycling Team is auctioning off the new men’s Giant Defy 1 Disc Brake bicycle show above to raise funds for BikeMS. The bike, which was donated by the Newbury Park Bike Shop in Newbury Park, has a retail value of $1,500. It’s still in the box, ready to be picked up from the shop or shipped anywhere in the US. And every penny raised by the auction will go to BikeMS to support people living with muscular sclerosis. 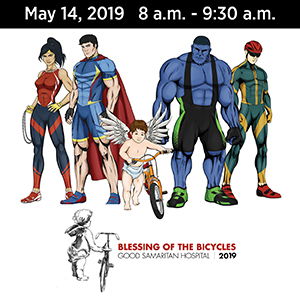 The 15-member CBS2/KCAL9 team has already raised over $10,000, and is one of the top fundraising teams leading into the June 3rd ride. Another good, but challenging, read from Peter Flax. He examines the death of fallen cyclist Mark Kristofferson in this year’s Tour of Palms Springs, who was killed at the hands of a drunk and stoned driver doing 100 mph, with a suspended license and a long history of traffic violations. And wonders why it’s so hard to charge motorists with murder. Let alone actually get a conviction. Thanks to Victor Bale for the heads-up. In one of the most bizarrely wrong-headed Op-Eds in recent memory, a former player for the Denver Broncos now living in Venice blames Bird scooters for allowing tech bros to avert their eyes from the homeless lining the streets as they zoom by. Except people have been ignoring homeless people for years, if not decades. And it’s even easier to ignore them while zooming past in your hermetically sealed automobile, with the windows rolled up to block out the sounds and smells. The real problem is a lack of caring at worst; a feeling of helplessness to do anything about it at best. It has nothing to do with a mode of transportation. Even if you do need a smartphone and a credit card to use it. Meanwhile, Bird scooters are getting the blame for a Nashville hit-and-run that injured two women, instead of the coward who fled the scene after hitting them. Pasadena Now looks at Bike Week in the Rose City, including tonight’s Women’s Bike Night. And don’t forget tomorrow is Bike to Work Day, which is basically like trick or treat for adult bike commuters. You can find a map of most, if not all, of the morning pit stops on the Metro website. Streetsblog’s Joe Linton reports on yesterday’s Blessing of the Bicycles at Good Samaritan hospital, including a way too cute photo of little tricyclists getting blessed. Santa Monica could get the area’s first protected intersection near the Santa Monica College stop on the Expo Line. Although at a cost of 94 parking spaces, which could be enough to make the traffic safety deniers get out the pitchforks and torches. 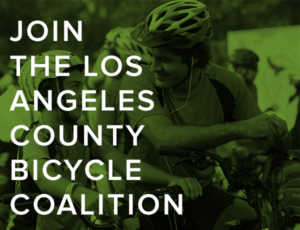 Culver City’s Bicycle and Pedestrian Advisory Committee will meet tomorrow night. 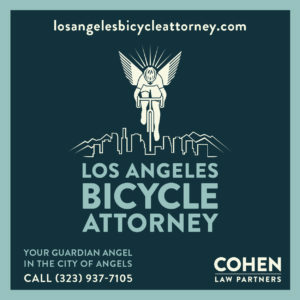 Streetsblog California looks forward to tonight’s Rides of Silence throughout the state. 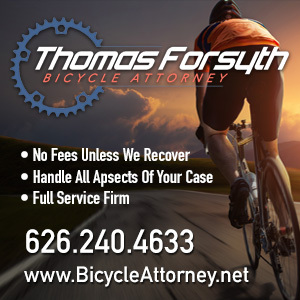 A San Diego man suffered life-threatening injuries when his bike was struck by a 33-year old driver after allegedly riding into oncoming traffic. Bicycling collisions are up in San Diego, rising nearly 30% in the first four months of the year. Maybe injuries are up because an increase in bikeways in the city is getting more people out on bikes, rather than due to dockless bikeshare, as the story implies. A Ventura museum is hosting an exhibit on the artistic beauty and love of bicycles. Streetsblog says it’s time to get rid of the right turn on red lights, which may be more convenient for drivers, but increases the risk for pedestrians and people on bikes. Treehugger aptly observes that the problem with Bike to Work Week is that it requires the infrastructure to enable people to ride to work all year. A Phoenix weekly offers tips on using dockless bikeshare, most of which involve where not to leave it. Former pro cyclist Mara Abbott bemoans the slow death of her hometown Boulder CO newspaper at the hands of its hedge fund owner, after the editor was fired for pointing out what was going on. A Denver writer demands more and wider roads, making it clear he’s never heard of induced demand. Or global warming. Maintaining a spectacular Vermont bikeway that crosses four miles of Lake Champlain could prove more difficult than building it, after it’s battered by wind-driven waves. BikeBiz talks with the co-creator of the Boston-based lighted Lumos bike helmet. New Yorkers will be racing through the city on bikeshare bikes this weekend. A columnist for the Philadelphia Enquirer says a protected bike lane would have saved the life of a bike courier who was killed in a crash last weekend. A 22-mile bike path currently under construction in Florida could open the way for bicycle agritourism. And no, I never heard of agritourism, either. A Florida bike rider says please stop killing my friends. Life is cheap in British Columbia, where killing a bicyclist while driving without “due care” results in just an $1,800 fine and a one-year drivers license suspension. The Guardian offers up five scenic backcountry bike rides in England’s West Country to add to your bike bucket list. Britain’s Road Safety Week will tell bicyclists and motorcyclists to Bike Smart. Of course, it might help more if the message was Drive Smart, for truck drivers and everyone else. A UK website suggests bicycling your way to a healthier and wealthier future. It looks like Zwift is getting a Romanian competitor for the world of virtual cycling. Bikeshare comes to North Korea in bike-friendly Pyongyang. A look at Monday’s Stage Two of the Amgen Tour of California by a local Santa Barbara site. VeloNews says 20-year old American cyclist Brandon McNulty came of age on Monday’s climb up Gibraltar. Crowds turned out for the start in King City and the finish at the famed Laguna Seca race track for Stage Three, which was won by a cyclist breaking from the pack to seize the victory in today’s spoiler-free update. In a reflection of the sad financial state of pro cycling, two of the teams competing in the AToC are racing for sponsors, as well as stage wins. Cyclocross legend Katie Compton switches sports to compete in the Women’s Amgen Tour of California, riding as a domestique for teammate Megan Guarnier. The four stage women’s race starts tomorrow — and no, you can’t see it on TV. Ella Cycling Tips talks with 22-year old former Aussie world juniors champ Macey Stewart, who will be rebooting her racing career for the second time when she starts at the Tour of California on Wednesday. Meanwhile, there’s still a men’s race going on in Italy. Outside profiles Marianne Vos, calling her the world’s best cyclist and a fighter against gender inequality. When the drunk who runs you down is a cop. Forget riding, just take a hot bath. And a $24,000 fine for running a traffic signal may sound extreme, until you realize that works out to less than 200 American dollars. On the other hand, ten days behind bars works out the same no matter what country your in. Yes, ban most right turns on red. At the same time place the traffic lights on the near side of the intersections to help drivers stop before the limit lines.